Cardiac arrest occurs when someone's heart unexpectedly stops beating. Without any treatment, death occurs within minutes. Treatments that are proven to work in cardiac arrest include cardiopulmonary resuscitation and giving an electric shock (defibrillation). If these treatments don't work drugs such as adrenaline and vasopressin are injected (usually into a vein) to try to restart the heart. The early scientific evidence which led to their use came largely from small studies in animals. Whilst some human studies have shown that these drugs can help restart the heart initially, research also suggests they may have harmful effects on the brain. The reviewers identified 26 randomised clinical trials, involving 21,704 participants, which examined the effect of adrenaline or vasopressin on patient survival after cardiac arrest that occurred in and out of hospital and in adults and children. 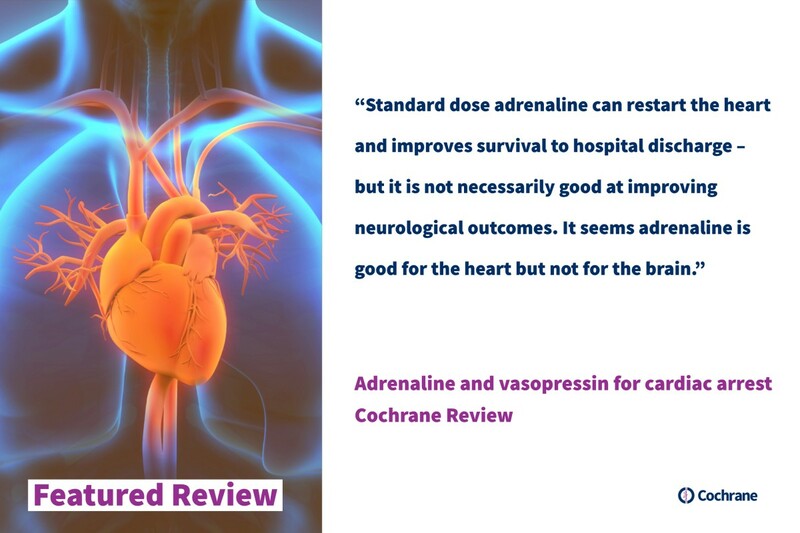 Some studies compared adrenaline in standard doses (1mg) with placebo (dummy medication); some examined standard dose versus high dose adrenaline; and others compared vasopressin alone or vasopressin with adrenaline to standard doses of adrenaline. The studies found evidence that adrenaline was effective at restarting the heart and helping people recover enough to go home from hospital. However, there was no evidence that any of the drugs improved survival with good neurological outcome. The overall quality of evidence ranged from high for studies comparing adrenaline with placebo; to at best moderate, but mainly low or very low for the other comparisons, due to potential bias within the studies. Many of these studies were conducted more than twenty years ago and the findings from older studies may not reflect current practice. The studies examined the drugs in many different situations (in and outside of hospitals, different doses, adults and children) which can make combining their findings misleading.